**Special Offer** Book a two night stay at Relax on Ridge and get a third night free until 31st October! Relax on Ridge is a luxury holiday house located very centrally in Oneroa. Staying here, you’ll have the best of both worlds. 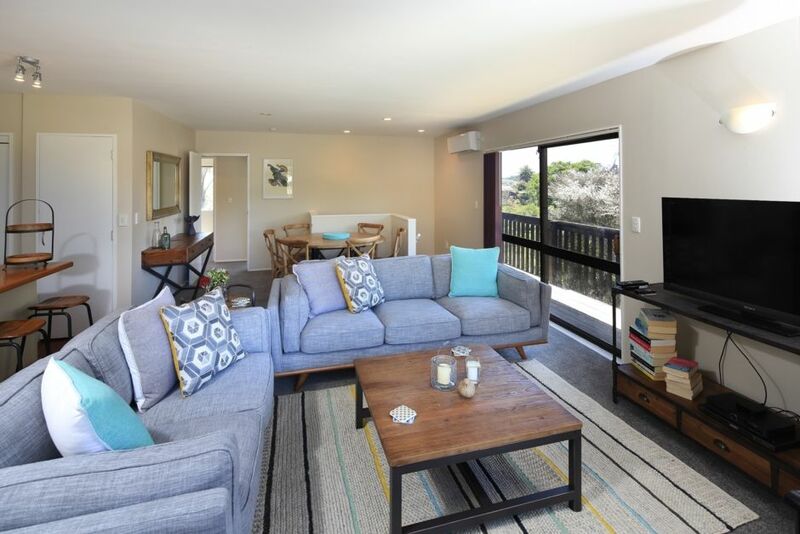 Close enough to walk to Oneroa village, Mudbrick or Cable Bay vineyards and several beaches, but located down a quiet leafy street so you don’t have the traffic noise (yes, we do get traffic!) the village does. The house is beautifully decorated to the standard you would expect in a hotel, but with all the comforts of your own home – Wifi, a large screen TV, Sky, Playstation and DVD Player. The kitchen has much more than you would expect in a holiday house, being fully equipped with an array of utensils for most dishes, electric hob, massive fridge/ freezer, dishwasher, Nespresso machine and microwave. Off the Kitchen is a laundry with washing machine, dryer, iron and board. The upper level also has a bathroom with shower and separate bathtub. Downstairs has a huge, sun-soaked outdoor area and backyard, making it perfect for families or relaxing away the evening over a BBQ and wine. There is also a second lounge and TV downstairs, perfect to have separate kids and adult areas. Your hosts are Chris and Kristyna - we are very responsive and helpful so if you want a hassle free holiday in a beautiful location, get in touch. We are two professionals with a new baby, recently settled back in New Zealand after having lived in London for three years and travelled Europe extensively. We like nice things and really care about our home and the people who stay in it. The house is kitted to a high standard, will be immaculately presented and we promise to always be available and responsive for any questions or recommendations in the lead up or during your stay. This house was perfect for our girls getaway, really handy location, spacious, clean , just perfect for what we needed. The 7 seater car that comes with it is a massive bonus. Thanks for such an awesome weekend, im sure we will be back. Close to everything and fantastic having the 7 seater. Relax on Ridge definitely lived up to its name. It had everything you need to relax and enjoy. Close enough to walk to the shops and beach. Lovely quiet location with lots of bird life. Perfect place to step away from the hustle and bustle. So central and family friendly. Everything we needed was there, great location, clean and tidy. Everything we needed was there, great location, clean and tidy. Use of the car was handy.